No - it isn't the 4th of July, but if you have an Xbox 360 and head towards the Indie Games section (it's tucked away near the back under the download games, hiding after the demos) then you'll spot that there are lots of new toys to play with over the next few weeks. Essentially all the top games designers on there got together and decided that they would all release a game in early December - ranging from 65p to a massive £3.20 (80 to 400 points in M$). There is even a list at http://www.indiegames-uprising.com/ so you can spot the gems more easily. Now regular viewers are probably wondering what this has to do with food & snacks? And you'd be right - the world of gaming and the world of snack foods don't often collide. The point of all these games is that they are homemade by small groups of people and sold to people who like good, unusual stuff - just like a big global online Farm Shop! Now I don't know whether all nations have these, but here in the UK they are essentially small cooperatives where a group of people get together and buy local produce and make their own and sell them from stalls. 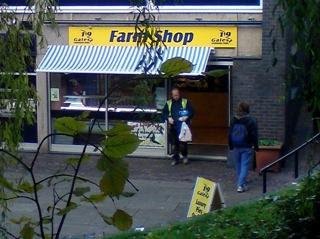 The one I'm featuring this week is 19 Gales Farm Shop at Birmingham University - so successful that they have their own store (see pic). The goodies on offer are not ones that you can go out and buy nationally usually (except for maybe the fantastic Apple & Rhubarb drink I had last week which was from here) but I hope that you can find a similar thing local to you to support. 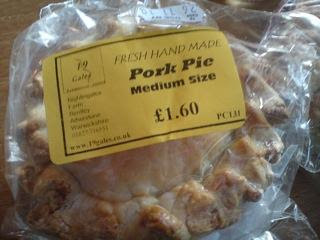 Today's item is this 'medium size' pork pie. You can't really see the detail on this as I foolishly chose to photograph it with the wrapping still on but it looks appetising and is cheap for the size. I ate it for lunch and almost couldn't finish it (I think you may be supposed to share this size, but it's nice to be indulgent sometimes). As you'd expect the meat is chunky and fresh, and the jelly around the edges is fantastic. It had an odd consistency as if the ingredients hadn't been completely stirred as one side had much less pepper than the other, but that just added to its charm. The pastry was lighter than I expected and while still not sweet had a more desert like quality to it than I'd expected. I'm a regular when I'm over that part of town and have a few more things from the store to share so will be back on Sunday. Sausage rolls are legendary too - especially hot. Farm packed bacon is expensive but great. I'm only a part timer so don't get over there that often but they have some great stuff.